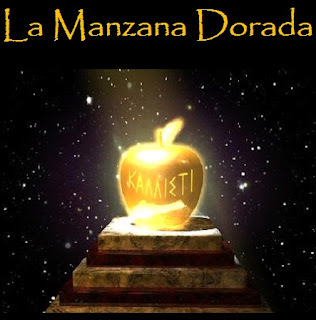 Over at the blog La Manzana Dorada, (e.g., "The Golden Apple,") written by Mazzu Stardust in Buenos Aires, Argentina, the newest entries report on a new reading group, which is going through Illuminatus! ten pages at a time, after the fashion of Illuminatus! If I understand correctly, this is a reading group that actually physically meets together, but Mazzu is posting his notes, and anyone who likes can post comments. This is a good opportunity for Spanish-language Illuminatus! fans. Salve Eris! O Salve Discordia! Mazzu taught me how to write that in Spanish. By the way, Friday gave me all sorts of lessons on how Robert Anton Wilson draws interest all over the world, and not just here in the United States, where Wilson lived and where I live. Friday morning, I got up at my home in the Cleveland, Ohio, area and noticed a Tweet from John Higgs (who lives in Brighton, England) who mentioned a Turner Prize exhibit in the U.K.; the Tweet resulted in yesterday's blog post. And I got an email yesterday from Christian Greer, the Dutch graduate student who studies Discordianism. (Update: Sorry, Christian is from Miami). After I finished my workday I took some books over to a local used book shop and noticed a display of copies of Illuminatus! with an unfamiliar cover; they turned out to be copies of the British edition. When I returned home, I got a message from Facebook from Fausto Marcon, who is Italian but currently lives in Barcelona, Spain. Fausto told me about Mazzu's new Illuminatus! blog entries. I looked for Mazzu on Facebook, found him (he's on as "Sirius Mazzu,") friended him and started exchanging messages. Which explains why I got a friendly message this morning, from a guy in Argentina, that included "Viva RAWIllumination.net!" Greetings from Bahía Blanca, Buenos Aires, Argentina, here, in Spaceship Earth - as Bucky Fuller said ("one of the few people to be aware that he lived on a spaceship") ¡Salve Discordia!! !